Traditional data management strategies will not scale to effectively govern big data for high-performance analytics. As a result, many organizations are evolving their enterprise architectures to address specific business analytics needs. To quickly maximize return on investment from SAS® In-Memory Analytics products, it's important to devise and deploy appropriate information management strategies. 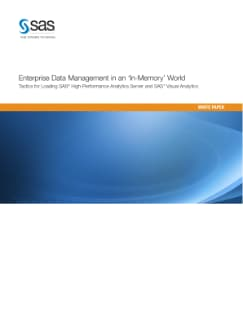 This paper discusses tactics, best practices and architecture options associated with loading analytics-ready data required for SAS High-Performance Analytics Server or SAS Visual Analytics. By using a flexible data management approach to get the most out of your analytic data warehouse, you will be well prepared to address a multitude of evolving business, operational and technical requirements.